I had a long chat with one of my good friends the other day. Since moving away from her we don’t talk nearly enough, so when we do we always have a ton to say. She gave me a list of things she had questions about or wanted to see on the blog. It was SO helpful to hear what someone, who is a distant reader thought and wanted to see more or less of. Having someone do some critiquing and evaluating was so helpful. If you were to do the same thing, what would you ask me to share more about? Less of? What are you liking or not liking? Feedback is gold to me! So per her request, here is a little update on how the hens are doing! The hens lived the summer at our Shanty property where we have a dilapidated house, and where our garden and the lambs were kept there. 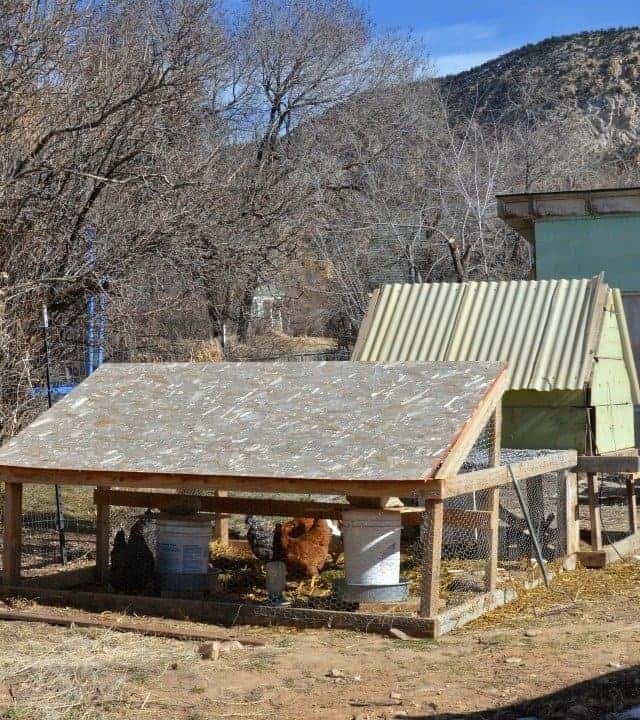 We would move their coop and run once a week so that they had fresh grass under them to eat and enjoy. When the weather started to turn cold it was inconvenient to run over there to give them water twice a day (because it kept freezing) and to collect eggs, but we were still moving them around so that they had fresh dirt or grass under them which they love and keeps things clean. In December we had a really cold snap and one of the hens got frostbite on her comb. We decided then that it would be better to move them over to our rental house so that they could have a heating lamb when needed. 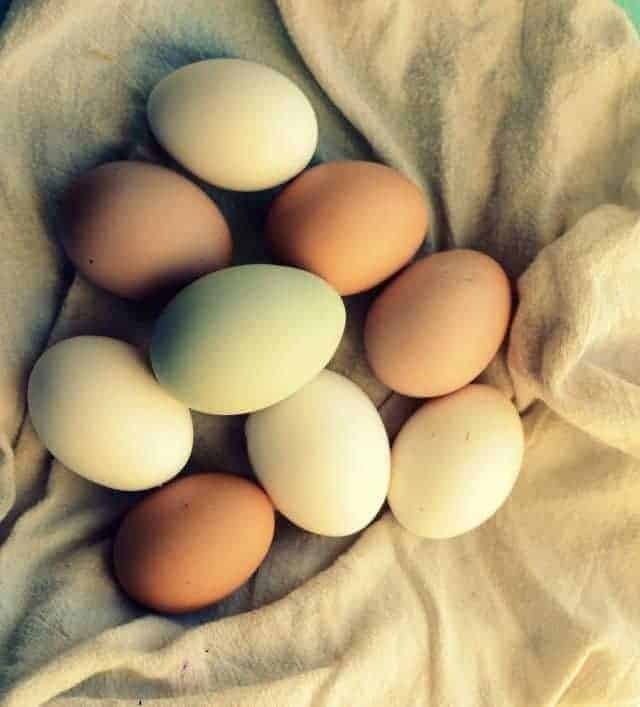 Having them in the backyard also makes it so much easier to take out scraps, keep them in fresh water, and to collect eggs. Plus it’s just fun to be able to let me out in the yard again. The down side of moving them here is that I can’t move the coop around. It needs to stay in one spot which means they don’t have as much fresh grass and things can get poopy fast. Keep reading and you’ll see how I’ve combated this. 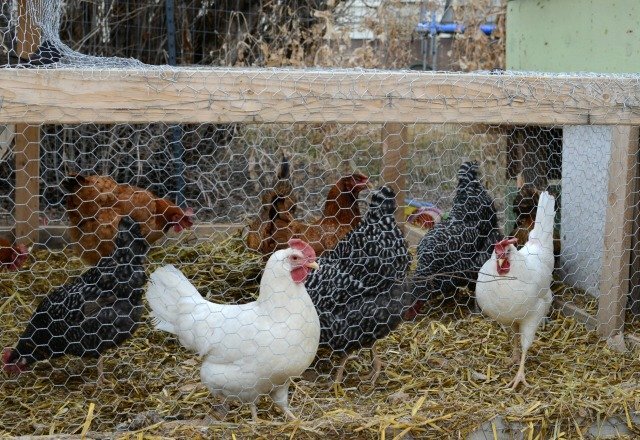 One of the biggest appeals of keeping backyard chickens is being able to look out the kitchen window while cooking dinner and watch them scratch and live their funny busy lives. Chickens are so calming and fun to watch. I’m really glad to have them back at our house. Here is there set up at the moment. Their coop and their run are just outside out backyard fence. The shed back there has electricity so I have ran an extension cord to their heat lamp and turn it on as needed. For the first few weeks they were here, I let me out of their coop every day and eventually just started leaving the whole thing open for them to come and go as they pleased. They’d just run around the yard and enjoy themselves and the go in for food and to go to bed. The down side to this is they were exposed to dogs. I hate that the world thinks their dogs should just be allowed to run around. No matter where we have lived there are always dogs out and ready to kill my hens. SO ANNOYING. So, as time and nature goes, I lost one of my three White Leghorns to a dog. They are bigger than any of my hens and fit in great. 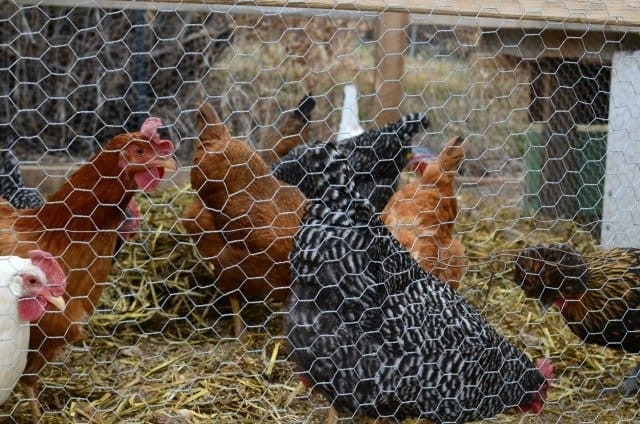 I couldn’t have everyone running around the yard until the new girls figured out that this was their new home, so I shut all of them into the coop and they had to stay there for at least a week so that no one got lost and confused. Now I have an even dozen hens. In order to keep things clean and to give the hens something to do inside the coop/run I got some hay for them. Hay bales come apart in big sections and so I’ll just throw in a few big clumps of hay and they LOVE to stand on it and kick and scratch it apart. They eat what they can and then kick around and organize the rest. Then when all of the hay is how they like it, they make little “nests” to sit in and take naps. It’s pretty cute. Here they are enjoying some fresh hay. When they chickens were allowed to run free I was getting about 4 to 6 eggs a day which I was super pleased with. And then when they were all stuck in the coop I started getting 9 to 11 a day! What I didn’t realize was that a bunch of the hens were laying somewhere in the yard/junk behind our rental. 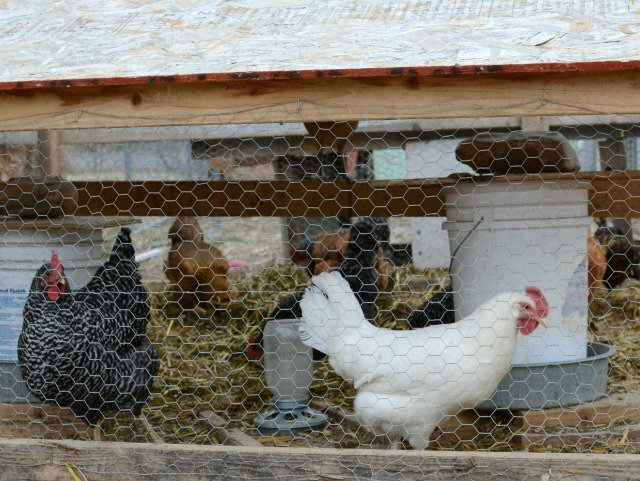 Having more eggs and knowing they won’t get killed by dogs has motivated me to keep them in the coop most of the time. I let them out occasionally for a few hours in the evening to scratch around, but at the moment they aren’t free-ranging. The eggs are totally worth any effort chickens might be (which is really next to none, they are way less work than the two cats we had at our old house…). And the kids love having the hens back at our house too. 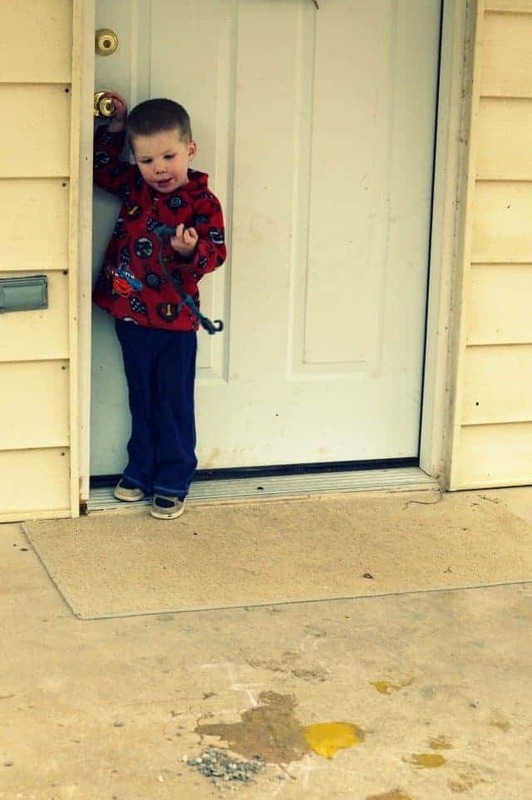 Here is the two-year-old explaining to me how the “oak” got onto the porch. When you mix little helpers and eggs you are bound to have a few get cracked. We are still using the feed and waterer that I made from 5-gallon buckets and they are awesome. And all would be honky-dory except for one little hen. We call her The Road Runner. The other hens just do not like her. I think it is because she’s a bit smaller and just looks different. The Golden Polish (the crazy headed one) is tolerant of her, but no one else will even let her walk by without being mean. She’s timid and scared and constantly running away or off by herself. I thought about giving her to someone else but I’m not sure she’d be any better off somewhere else. She’s at the bottom of the pecking order and everyone knows it. At least she isn’t bald or missing feathers; she does have enough room to get out of the way. She just seems a lot more happy when all of the other hens goes out of the coop/run. I’m still trying to decide what is best for her. Other than that things are great. The hens eat table scraps like you wouldn’t believe, they are laying tons of eggs which we eat and eat and love and then eat some more, and they are comfortable here. Have a great day and feel free to let me know of anything you would like to see more of, less of, or anything in the middle. You are the best readers ever! Love your blog! 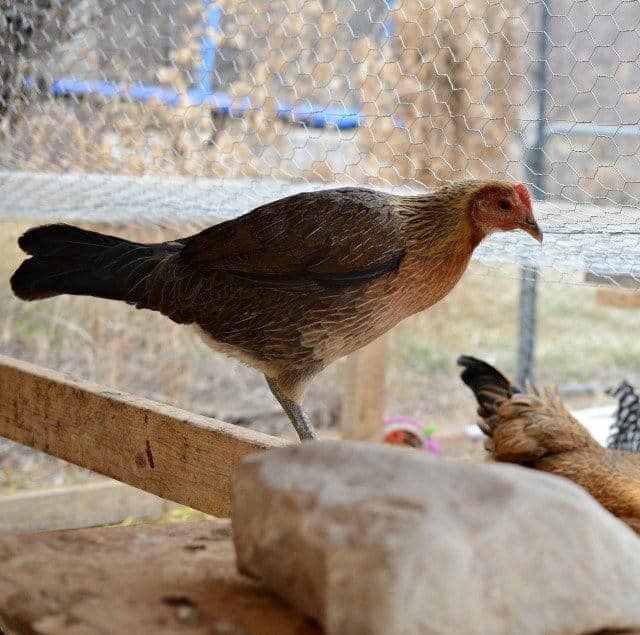 I just got a coop – and am contemplating pullets or chicks. 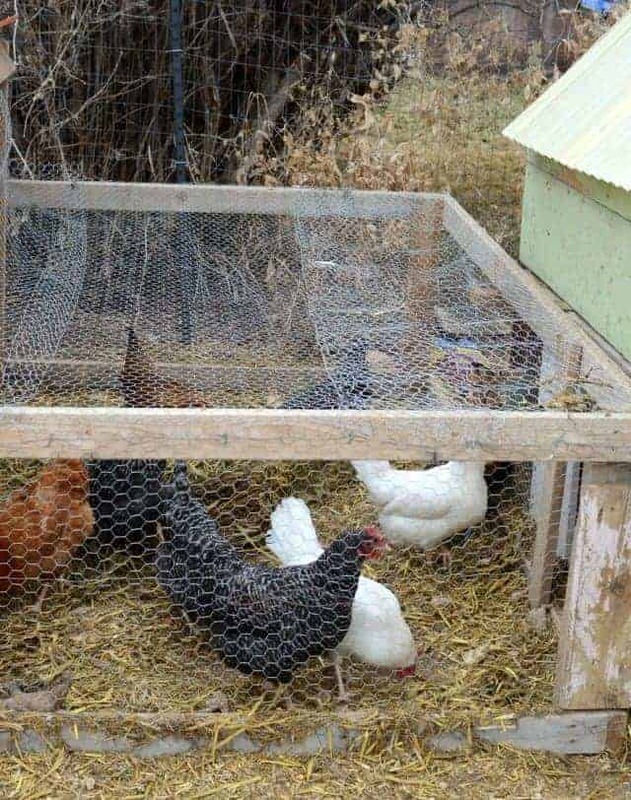 My question though, is do you do anything special to keep the chickens warm during the polar vortex cold? Normally it doesn’t get this cold around here but now I find myself worrying about it for my chickens next year. I’m in southern Utah and we are having unseasonable highs (and we aren’t complaining either!). Where we lived last year was so cold though! 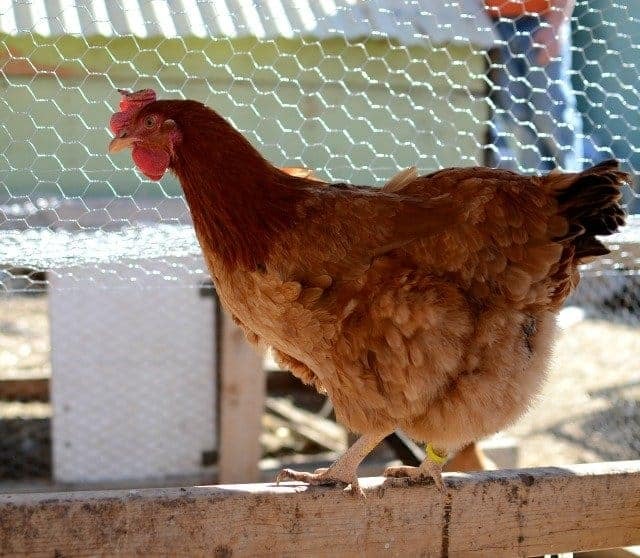 You can get breeds that do well in cold weather, you can use a heat lamp, you can do a “deep liter” method for keeping your coop naturally warmer in the winter (good for the garden in the spring too). So you have lots of options but you just have to see what works best for you and your set up. How do you think you’ll keep them warm?